+1 for the uklegacy.com family. When I had a 1999 Legacy I found their help invaluable. I miss my Legacy, it was a 1999 one and a 2.0 NA GL spec. Poverty spec really, but I bought it from a chap at work last year for a bottle of whiskey as it was just laid up in his lock up. Loved the car for the short time I had it, but the wife wanted it gone and after I pulled and tore a ligament in my ankle changing gear (the clutch was stupidly heavy on it) I was forced to sell it. Checked on it the other day actually, the chap I sold it to scrapped it. So the timing belt snapped or he wrote it off. You can't begin to understand the regret I have over getting rid of it. These weigh around 1400kgs, nowhere near the 1800kgs stated in the article. I have a Gen 3 GT-B which is a tad heavier at 1500kg, but they had also made some good improvements to things like the VOD and fuel economy by then. Its a great car and I've become quite attached to it after 10 years, but I do sporadically think about trading it in on a newer 3.0R 6-speed. IIRC peak power is at 6500 and peak torque torque at 5000, the original advertising guff claimed over 80% of torque on tap from 2000-6500 (redline at 7500, limiter at 7750). They're a lot more linear than the single turbo Subarus with less mid-range grunt but a stronger top-end pull, a mate had a Gen 3 GTB and a Ver 9 STI at the same time and reckoned the GTB beat the STI for top end. Also as for subaru parts being expensive, I found they were more reasonable than the VW ones on my passat. There also tend have a lot less fripperies to go wrong. For a weekend tinkering and bike/keyboard/drum kit hauling this is really tempting. Good find, a car that's cool, quick, good handling, practical and reasonably reliable for shed money. The NSX, Supra and RX-7 have all more than doubled, albeit from quite different starting points, 300ZX too I think. Cars like the Scoobies and Evos sold a lot more, I doubt they'll be super valuable any time soon but yeah I wouldn't be surprised if they rise a bit. I've owned the model before this one (a single turbo saloon) and the model after (a GTB). Awesome cars, among the best I've ever had, and remembered only with affection by both me and Mrs Teacake. Indecently quick, especially if the conditions are a bit adverse. The only real downside we found was the godawful seats. I always thought the BG5 version in this ad looked a bit jelly-mould, and it dated quite fast, but who cares about that when you're in the driving seat? As Ahbefive says, these were more like 1400-1500kg. 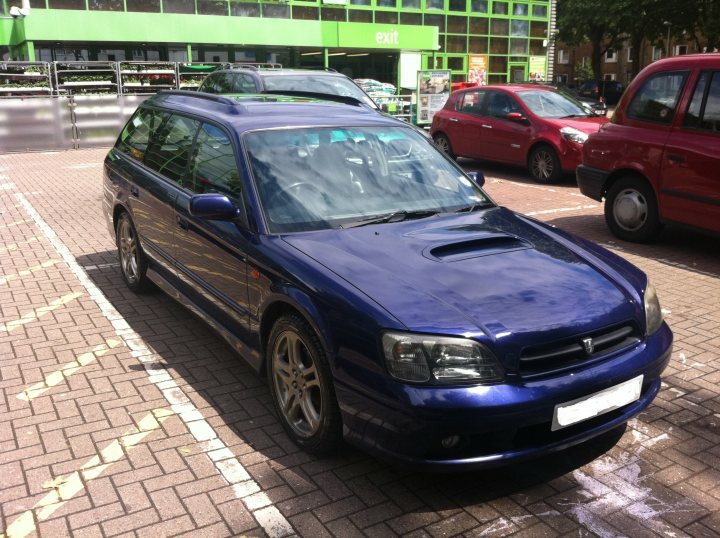 Been looking for a fast estate for around £20k. Maybe I should get this instead and keep the change for petrol money and maintenance. Only 40 miles away too, that is rather tempting. Yet another great shed! In all seriousness they already are for some 'special' 90s motors. Yes, yes you should! And the reason being that £20k still isn’t going to buy you the latest and greatest model and therefore your none PH neighbours are going to judge on the age of the registration plate. There is a reason the landed gentry smoke around in ancient landy’s Etc. A performance classic like this will be just as fun (more so) and whilst your newer £20k waggon will depreciate rapidly a car of this age if loved will likely appreciate! Not buying a car because of its mpg is idiotic when most people lose far more to depreciation. I just can't keep up with all the great sheds this year. I had a good long look at the succesor of this when scratching my head about fast estates back in the early 00's. The left field nature of them really appealed to me (and still does). These are great cars, I'm surprised they hold so little value. I've got a 96 GTB which I've owned for 6 years and it's fantastic. It's not only fast, but also handles really well especially for a car of it's size. It is really as fast as you ever need on the road and AWD means it accelerates so well out of corners, it's such a good overtaking car. It's not all positive though, big end failure is mentioned in the article, but head gasket failure is really common too. 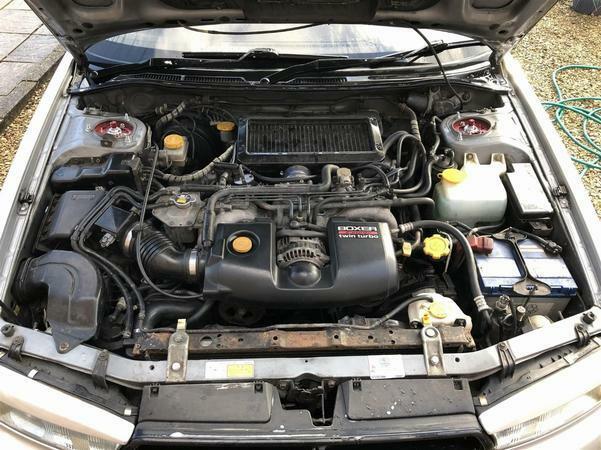 Mine's had one owner since being imported and came with full Subaru service history, yet the head gaskets still needed replacing due to corrosion of the mls head gaskets. It's a really involved job, even with the engine out there is so much going on that it's a huge amount of work. An issue for me deciding if I want to own it long term is the quality of the interior plastics, they just seem to be so brittle now that it's impossible to remove trim without breaking it. It's not all available new anymore even if the expense was justifiable, it's a shame as it makes it really hard to want to keep using the car daily for fear of wearing out parts that can't be replaced. They're worth so little that there just aren't many good ones left. I had the model after with about 150,000 miles on it. It was a 2000 manual full leather GTB back in 2009 for £1,700. Went like stink, but did like a drink. The 170mph claimed top speed was very believable given it was still pulling hard on the autobahn at a GPS 150mph. 20,000 miles and 3 years later (+ a belt change and a 2nd hand gearbox replacement) I sold it for £1,750. Wish I never had. Excellent Shed, much overlooked car and very under rated. In 2007/8 I took the year off to do my house up and travel a bit, I also owned an Evo 1 integrale at the time and looked for a daily that could be fun and unassuming. After looking at Legnums, RS4s, and many others I stumble across these. 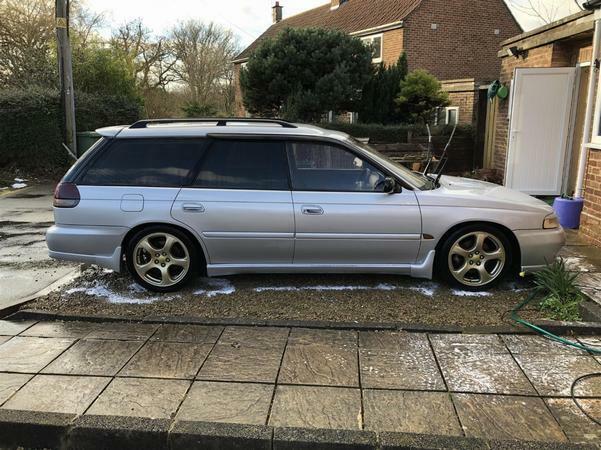 Imported a 1997 wagon in white that had 33000 miles on it, it arrived on 311207, and it was mint, even had the goldish colour still on all the suspension bolts and underneath was as clean as a new car. 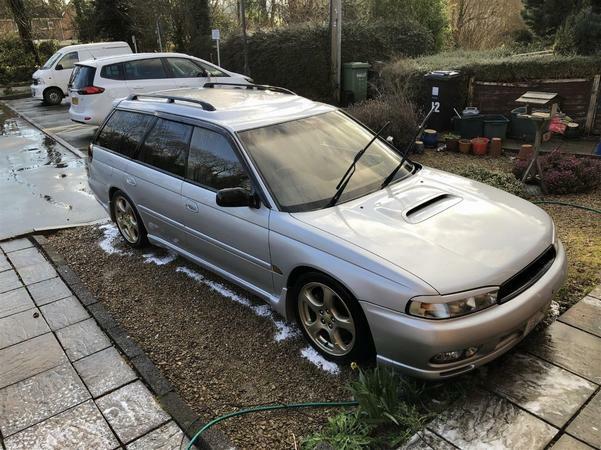 Anyway I have now had 4 x GT-Bs, 1 x Outback, 1 x Legacy diesel, 1 x 3.0 Spec B Wagon and now a JDM Twinscroll Wagon and I can honestly say I am stumped as to what I could replace it with, for the value, performance, spec, build quality and being something no one really knows what it is. My GT-Bs did sound rough on a cold start due to the forged pistons, but soon goes away. I saw 163mph via a GPS on the AutoBahn chasing a 57 plate RS4, I had paid £3300 for the GT-B that he wasn't shaking. Subaru parts are not overly expensive and ICP can source JDM car parts. Great shed and some great fun to be had with that car. The only real downside we found was the godawful seats. We must be quite different shapes or have had quite different spec cars, my BH5 GTB has some of the best seats I've had - very supportive and comfortable. The BG5 TS-R (155bhp 4cam NA) I had before it had good seats too, but Outbacks of similar ages were too flat and unsupportive.